We worked our tails off this weekend laying hardwood flooring. 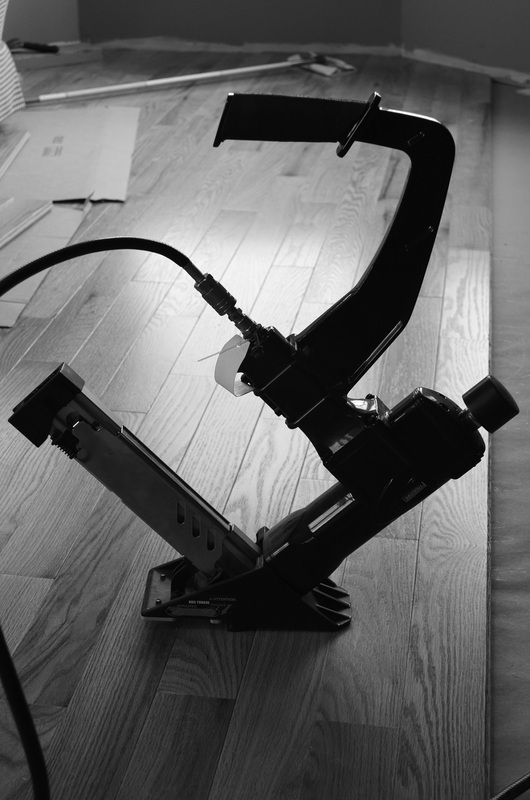 The floor nailer has all sorts of crazy angles and had some pretty cool backlighting. I saw you take that picture and that what a great eye you’ve got. The photo in B&W is a strong graphic composition. You do great work! If I search the site, will I be able to catch up with what’s been happening with you and Bryan, house-wise ? I’m liking the new theme too. Sometimes change is good! Alas I haven’t posted any progress pictures on the house. We made some major progress this weekend so hopefully I’ll have some free-ish time to post some soon! Cool lines….this is quite excellent. Thanks.